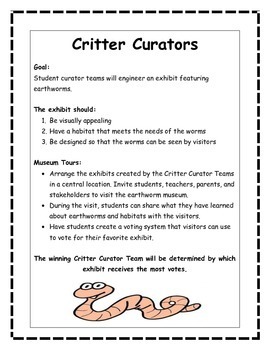 Critter Curators is a great hands-on activity that students of all ages will enjoy. 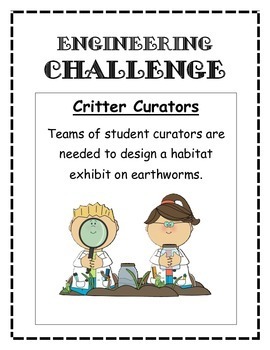 Wanted: Teams of student curators are needed to design a habitat exhibit on earthworms. Students will enjoy working through four earthworm investigations to discover the perfect habitat for their worms. 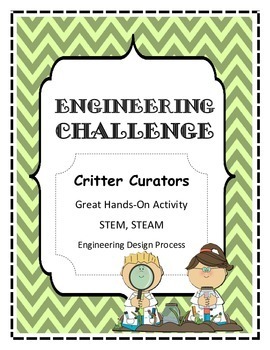 Students will engineer an exhibit that is visually appealing, informative, and habitat appropriate. Teacher and Student Friendly! 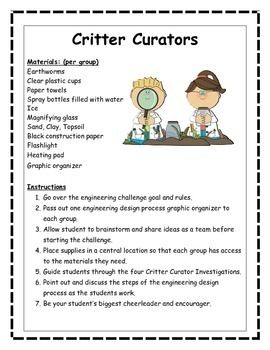 This product includes: Essential Question, Materials List, Instructions, Goal, Challenge Rules, Four Investigations Task Cards, Graphic Organizer, STEAM Reflection Page, Discussion and Journal Questions.